However, there is another type of meatball that is by no mean sour but has also become a well-known food. Called Grill Meatball, it is an inevitable dish of local people as well as of visitors from outside the regions. Eating Ninh Hoa grilled meatball in Nha Trang is no different from having it in the district located 34 km away from the city as the cuisine and the sauce are still the same. 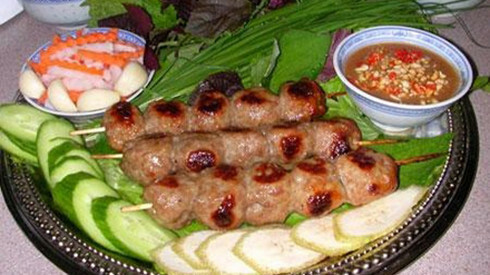 In general, Ninh Hoa meatball is made of pig’s leg. The meat is grinded before mixing with garlic, chili and sliced pork skin. The mixture is then divided into small pieces, each of which can be wrapped in a special type of leaf to make Sour Meatball or grilled to make Grilled Meatball. On any table of a Ninh Hoa restaurant, beside the grilled meatball ordered, there is a plate of sour meatballs to eat as appetizer. We eat all kinds of meatball with fresh vegetables and chili sauce to get the most delicious taste. You can also wrap the meatball with rice paper to make a summer roll. If you decide to do so, remember that each type of veggie adds a different flavor to the roll. The last thing to do is to follow your creativity and enjoy the delicious food!